Grand Alexander ​– Russia 1817. Parent of Wolf River. Not a keeper. Fresh eating and cooking. Arkansas Black​ – Arkansas 1870. May be a seedling of Winesap. Good for fresh eating, cider, cooking and pies. Infertile pollen. Ben Davis ​– Attributed variously to Kentucky, Virginia, or Tennessee. Pre­Civil War. Exceptional keeper. Good pollinator. May not ripen in some areas. Blue Pearman​ – New England 1833. Flavor is mild, aromatic, and sweet. Esopus Spitzenburg ​– New York 1700’s. Thomas Jefferson’s favorite apple. The flavor radically improves with storage. Delicious all around apple. Ananas Reinette ​– Netherlands 1821. Develops a pineapple flavor late in the season (its name means pineapple russet). Fall Pippin ​– An old apple dating to the early 1800’s and formerly a very popular variety, especially in the Shenandoah Valley where it was favored as an early winter apple. Thought to be an American apple thought its true origin is unknown. Large yellow fall apple. Good keeper. Fameuse​ – Canada 1739. Known as the snow apple. Possible parent of McIntosh. Name comes from its pure white flesh, occasionally stained crimson near the skin. One of the few apples that grows true from seed. Calville Blanc D’Hiver​ – France or Germany 1598. Has the highest vitamin C content of any apple. Excellent for sauce, cooking and dessert. Golden Russet ​– Seedling of English Russet. New York 1845. The champagne of old American cider apples. Used for cider, dried apples, eating, and cooking. Egremont Russet ​– England 1880. Prized as the most delicious of the English Russets. Greenish yellow, richly flavored. Good keeper. Duchess of Oldenburg​ – England 1817. Originated in Russia. Grandparent of Northern Spy and McIntosh. Almost too tart to eat fresh, but makes excellent pies and sauces. Belle de Boskoop​ – Holland, 1856. Outstanding for dessert, cooking and baking. Excellent keeper. Needs a pollinator. Niedzwetzkyana​ – Kyrgyzstan native, discovered 1891. Flavor is balanced between sweet and tart and sweetens if left on the tree longer. Tree is vigorous and ripens late September.All­purpose apple with striking fall colors. Roxbury Russet​ – Roxbury, Mass. 1649. Good for fresh eating and cooking. Remarkable for its amount of sugar. Great keeper. Resists scab and mildew. King of Thompkins County ​– New York Prior to 1804. Good for eating and cooking. Tip Bearer. Stores well. Twenty Ounce​ – New York, 1840. Very large, attractive premier cooking apple. Also great for dessert. Wealthy ​– Minnesota, 1860. Attractive, pale yellow red striped fruit with distinctive flavor. Compact tree blooms profusely and is an excellent pollinator. Wagener​ – New York, 1791. Excellent for cider, sauce and fresh eating. Tends to biennial bearing. Great keeper. Westfield Seek­No­Further​ – Massachusetts, 1796. Excellent for fresh eating and drying. White Winter Pearmain ​– England, 1200’s. Oldest known English apple. Fine grained, crisp, tender, juicy flesh with a rich aromatic flavor. Mother ​– Massachusetts 1840. Good for eating, and pies. Great fresh off the tree. 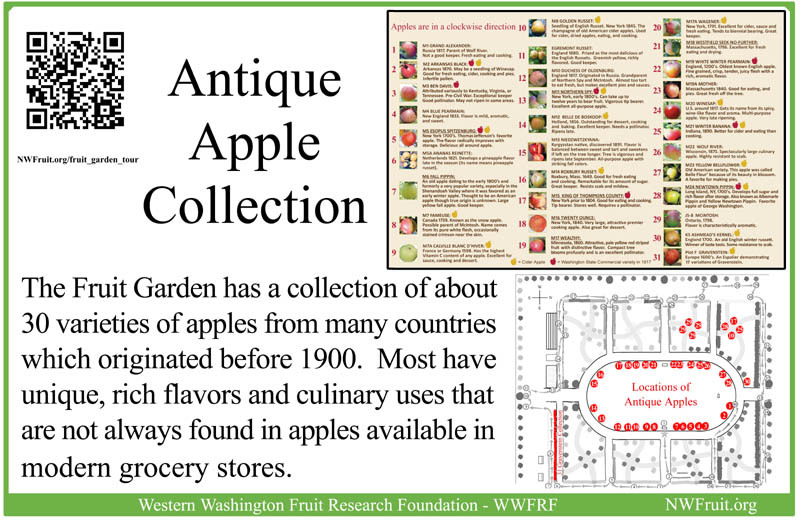 Winesap ​– U.S. around 1817. Gets its name from its spicy, wine-­like flavor and aroma. Multi­purpose apple. Very late ripening. Winter Banana ​– Indiana, 1890. Better for cider and eating than cooking. Wolf River ​– Wisconsin, 1875. Spectacularly large culinary apple. Highly resistant to scab. Yellow Bellflower ​– Old American variety. This apple was called Belle Fleur’ because of its beauty in blossom. A favorite for making pies. Newtown Pippin ​– Long Island, NY, 1700’s. Develops full sugar and rich flavor after storage. Also known as Albemarle Pippin and Yellow Newtown Pippin. Favorite apple of George Washington. McIntosh ​– Ontario. 1798. Flavor is characteristically aromatic. Ashmead’s Kernel ​– England 1700. An old English winter russet. Winner of taste tests. Some resistance to scab. Gravenstein​ – Europe 1600’s. An espalier demonstrating 17 variations of Gravenstein.